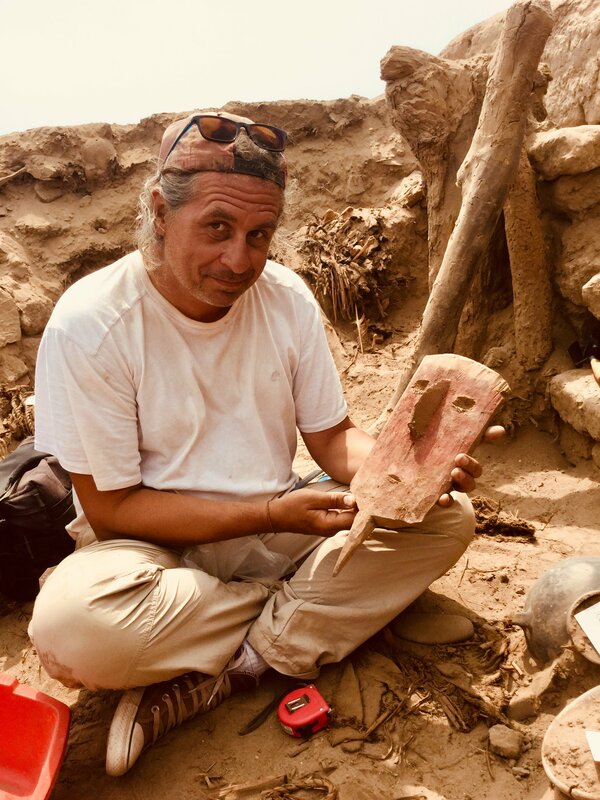 Researchers from the Université Libre de Bruxelles’s Center for Archaeological Research (CReA-Patrimoine) have discovered a mummy bundle in nearly pristine condition at the archaeological site of Pachacamac about 25 miles southeast of Lima, Peru. Preliminary analysis based on the layers, the tomb style and its location indicate it dates to 1000-1200 A.D. A sample from the bundle is in the process of being radiocarbon dated now. Pachacamac was founded around 200 A.D. and existed until the arrival of the Spanish. The archaeological site has the remains of monumental buildings — three major temple step pyramids, later step pyramids believed to be palaces for the secular rulers — and cemeteries, but has been severely damaged by looters and the elements. Because of all this damage, the discovery of so intact a mummy bundle in situ is extremely rare. The excavation was part of the Ychsma project, named after the indigenous people of the area. 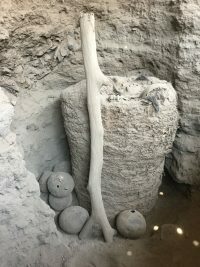 After nine weeks of work, this year’s dig was almost over when the team discovered the bundle in large structure believed to be a sanctuary to the ancestors. The sanctuary had been used extensively by the pre-Inca residents of Pachacamac for funerary purposes and was studded with tombs and mummies. Most of the burial chambers were emptied out in the wake the Spanish conquest and what the looters didn’t get, water infiltration did. They had only found a few funerary offerings during the previous nine weeks, wooden false heads once part of mummy burials, pottery, most notably groups of Spondylus shells and beads. They were imported from Ecuador and were expensive trade items. They also had great religious significance as symbols of fertility and abundance associated with the waters brought in by El Niño. The team was pleased with these finds and never expected to discover an intact burial chamber holding an intact mummy in its intact bundle. It was carefully wrapped with protective materials on site and transported to the laboratory where researchers will have the opportunity to study it non-invasively without removing the bundle. They plan to use X-rays, axial tomography and an assortment of imaging methods to create a 3D reconstruction of the mummy and its wrap. The reconstruction will allow them to explore the bundle, any artifacts placed inside of it and the mummy itself. Its burial position will be visible, and if all goes well, a full examination of the individual’s anatomy — age, gender, illnesses, overall health, maybe even cause of death. The Ychsma project excavations this year bore fruit in other significant ways too. This entry was posted on Sunday, May 27th, 2018 at 8:00 AM	and is filed under Ancient. You can follow any responses to this entry through the RSS 2.0 feed. You can skip to the end and leave a response. Pinging is currently not allowed. I wonder what the stick was for? Did it use to poke out above the ground?